Proof Bakery and The Healthy Church Initiative have been announced as the winners of the Cinnamon Project Lab 2018. “Coventry-based Proof Bakery sell and deliver artisanal bread subscriptions to local church collection points, supporting refugee women into work. Healthy Church Initiative, based on South London, is a six-week health intervention which educates and transforms nutritional health in African-Caribbean churches and communities. “Need we remind you that while the finalists were presenting their initiatives in front of a panel of judges and invited guests in London, the England football team were battling to victory out on a pitch in Volgograd? “There were, of course, some rather important differences. “The one thing that participants in the Cinnamon Project Lab often talk about is the camaraderie of the finalists, and, indeed, it was tangible on Monday evening. Unlike the national teams in Russia who are kept apart until they meet in the tunnel to walk on to the pitch, the finalists of Project Lab 2018 are in this together from day one. They prayed together, honed their presentations together and encouraged one another every step of the way. “It might seem like a cliché to say that all the finalists were winners – but the reality is they are. 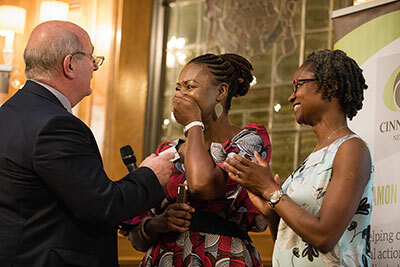 While the two winners of Project Lab 2018 will receive a development grant of £30,000 plus entry onto the Cinnamon Incubator, more than £9,000 was pledged by guests on the evening that will enable the other three finalists, Breaking Bread, Living Loss and Proudtobeme, to join the Project Incubator too. “We live in a society where, for every winner, there seems to be a loser. Within school, work and even in church we may feel that we have to progress and achieve under our own steam. And yet in the Kingdom of God, this is an alien concept. God calls for us to work together as a team for the much greater purpose of building his Kingdom. “That’s what Cinnamon Network is all about – equipping churches to work together to serve their communities. As the Project Lab finalists take a moment to consider the exciting future that lies ahead for them, they can do so in the knowledge that they are not alone. The sense of togetherness will continue throughout the Cinnamon Project Incubator as they develop their remarkable initiatives to a point where they can be replicated in many more churches across the country. “It was a pleasure to work with the five remarkable initiatives and we can’t wait to see what God has in store for them. To find out more about this year’s Project Lab 2018 finalists, take a look at the Cinnamon website.